1 Caption: This picture taken by the ISS shows a rare Southern Hemisphere cyclone (that is why it shows a clockwise rotation). 2 Hurricanes form over warm ocean water. Most of them form in the South Atlantic Ocean. They only form in the summer and early autumn months. 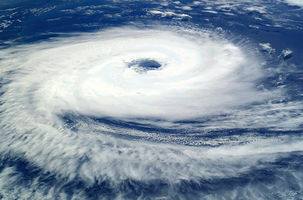 Without the heat of the warm ocean during the summer months, hurricanes could not form. No one knows exactly what causes hurricanes. 3 We do know that during the months of May to November, large areas of very low pressure form over the surface of the ocean. Warm, moist air rises, creating low pressure areas. Cooler air pushing down from the north begins to take its place. The moving air begins to swirl, and a tropical cyclone begins. 4 A tropical cyclone can be seen on radar. The rain clouds that form a tropical cyclone make a spiral. The spiral swirls counterclockwise in Northern Hemisphere cyclones. It looks like a giant doughnut. The hole in the middle is called the eye of the storm. The eye is an area of very low pressure. It is an area of calm while the storm swirls around it. 5 These storms can be hundreds of miles wide. Warm damp air from the warm ocean water rises up inside the eye several miles high. As the air rises, it cools. Rain falls. Cooler air falls, too. This puts pressure on the warm sea air. The pressure pumps the warm sea air back up into the eye of the storm. The storm grows. Feedback on What Are Hurricanes?